Emerging markets such as India, China, and Africa etc. provide a huge growth potential for confectionery products. Africa is expected to showcase second fastest growth rate in terms of consumption for confectionery packaging after Asia-Pacific. This region is also witnessing an inflow of foreign investment in manufacturing of confectionery products. South Africa is expected to exhibit progress in terms of income levels, further supporting the strong economic prospects of the African region. Multinational as well as domestic players are anticipated to enter the markets through various entry strategies that include exports, sales agents and manufacturing. Multinational players as well as domestic players are setting up manufacturing operations in emerging markets and are characterized by shifting away from ‘premiumisation’ of confectionery products. Domestic manufacturers and multinational players of APEJ and MEA regions are on the other hand targeting cash strapped consumers in such regions as a part of their strategy who seek value added products. This is due to the fact that untapped market segments in the emerging economies represent a huge target market opportunity for chocolate, sugar and gum confectionery products. Further, the APEJ and MEA regions have a huge young population with the average age below 20 years. Young median age and a growing middle class in such regions are expected to fuel the demand for end use products that are packed in stickpacks and boxes. As the internet continues on its trajectory of dominating the lives of the consumers, the growth of e-commerce is reaching new heights. Chocolate is the most preferred confectionery product in online sales. A growing consumer preference for dark chocolates is surging the demand for e-commerce confectionery packaging market. Hence, many chocolate manufacturers are opting for various initiatives to launch new products and flavours. For instance, Mondelez has teamed up with Amazon to create a virtual chocolate and sweets store on Amazon’s online marketplace. The shipping logistics market is growing consequently on the backdrop of a tremendous growth in the e-commerce industry, wherein consumers are ensured the delivery of the products in prime condition. Increasing penetration of modern trade and e-commerce has resulted in more number of consumers availing online retail services. This is attributed to the convenience associated with monetary transactions, product shipment and delivery. These factors, in turn, are expected to boost the growth of the global confectionery packaging market. As per the data given by Future Market Insights, the plastic segment in the material type category was estimated to be valued at nearly US$ 5,200 Mn in 2017 and is likely to touch a valuation of nearly US$ 7,050 Mn in 2027, exhibiting a CAGR of 3.1% during the assessment period 2017-2027. The paper and paperboard segment in the material type category was estimated to be valued at nearly US$ 2,150 Mn in 2017 and is likely to touch a valuation of nearly US$ 3,500 Mn in 2027, displaying a CAGR of 5.1% during the period of assessment. This report tracks the global confectionery packaging market and presents the value and volume forecasts for this market for a period of 10 years. The growing consumption of confectionery products such as chocolates and gums among others has propelled the demand for innovative and efficient packaging solutions. Packaging of confectionery items has an important role to play as they preserve the quality, texture and taste of the product. Increasing demand of confectionery products among all age groups has propelled the confectionery packaging manufacturers towards innovative and appealing packaging solutions, as it helps to enhance product visibility. In order to have an ease of understanding and for the better organization of the report, the report on global confectionery packaging market has been divided into four distinct parts. The first part of the report contains the introduction section that contains the executive summary of the report along with the market taxonomy and the definition of confectionery packaging. 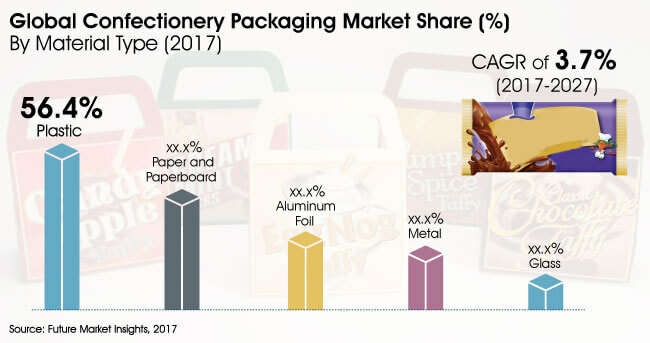 This valuable section of the report also contains information on the market viewpoint and the opportunity analysis of the global confectionery packaging market. The Porter’s Five Force analysis for the global confectionery packaging market is also given in this section of the report. This section of the report also contains the co relation analysis for the global confectionery packaging market, pricing analysis and value chain analysis for this market. The second part of the report contains the global confectionery packaging market analysis and forecast by material type, confectionery type, by packaging form and by region. This section of the report contains important market numbers in the form of market attractiveness index, incremental dollar opportunity and basis point share analysis. The third part of the report contains the regional confectionery packaging market analysis and the regions are chosen as per the market taxonomy. In this section of the report, the regional market numbers are discussed in great detail along with the regional drivers, restraints and trends affecting the respective regional markets. The last part of the report features the competition landscape of the global confectionery packaging market and has information on the key players operating in this market. The competition landscape contains detailed information on the important companies operating in the global confectionery packaging market in the form of company description, product overview, key developments, strategic overview and key financials of each of the featured companies along with the SWOT analysis of the companies. This competition landscape is a valuable part of the report as it contains all the necessary information to study the leading companies operating in the global confectionery packaing market in detail and also reveals how they implement their strategies and vision to stay at top in this highly competitive market. Overall market size has been analysed through historical data, primary responses, and public domain data. Revenue of companies in the global confectionery packaging market has been benchmarked to ascertain the market size for the base year. Macroeconomic indicators such as GDP and industry growth have been considered to forecast the market size over the forecast period. The historical growth trend of end-use industries, market participants’ performance, as well as the present macro-economic outlook has been taken into consideration for estimating the overall market trend forecast. This data is then validated using the triangulation method and is extensively scrutinised using advanced tools to garner quantitative and qualitative insights into the global confectionery packaging market. 19.3.13. Clondalkin Group Holdings B.V.